One diaper featuring EVERYTHING you love about Thirsties! Adjustable fit, leg gussets, hemp/micro inserts, front and back pocket opening = true love! Tall, short, slim or chunky, your baby's bum is covered when you use the NEW Thirsties One Size Pocket Diaper! 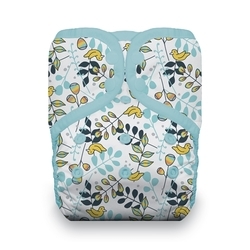 Same great quality and design you've grown to love and expect from Thirsties but presented in a cloth diaper that will fit baby from 8lbs through 40lbs! Ultra-absorbent inserts that snap together for ease of use provide baby with 8-layers of absorbency, perfect coverage for day or nighttime use. Three layers of microfiber and five layers of extra thirsty hemp create a comfortable, trim fit. Generously sized front and back pocket openings make this diaper easy to stuff and effortless to wash. What are the benefits of front and back pocket openings? The inserts don't have to be removed before laundering, they agitate out during the wash cycle! Thirsties’ signature leg gussets and snap closure make this diaper a favorite for dads, daycare and general everyday use. I love the fit of Thirsties pockets! They fit trim and there is a lot of room to grow. I feel like these will easily last until potty training. The prints are also super cute! My favorite thing about them is that they come with a hemp insert and a microfiber insert instead of two microfiber inserts like most brands. I like that I didn't have to upgrade the inserts for this diaper. I absolutely love this pocket! The double gusset gives it a little more narrow fit between the legs which I like. And the happy camper print is seriously so cute. The stay dry option is great for sensitive skin babies -it’s been great for mine! I'm not ordinarily a pocket person, but I've gotten some lately for our childcare situation. So far this is my favorite pocket. I love that it has both hemp and microfiber - I feel like I can trust this diaper to absorb quickly due to the microfiber and to guard against compression leaks with the hemp. I'll start by saying pocket diapers aren't for everyone. However, if that's what you prefer, these are great! We mostly use covers and AI2 at home but I send pocket diapers to daycare. The fact that I don't have to pry out the inserts before washing is very nice. They're a nice fit for our 11lb baby, which hasn't been the case with all one size. They have cute colors and patterns. They are expensive but many companies keep costs down by including microfiber inserts. I love that Thirsties gives one micro and one hemp! Purchasing hemp inserts isn't cheap so, considering that, I think the price is quite reasonable. Definitely a good choice if you want to go the pocket route. And if you prefer Velcro, Thirsties is very strong and long lasting! We tried the pocket for the first time when Tortuga released and it was love! These have the softest lining and the best fit! Love the double gussets!